The Oceanic Systems 3420 AC Monitor accurately measures the AC voltage, AC current and AC Frequency and reports them over the NMEA2000® network. The unit can be used for Single Phase, Bi-Phase and Three Phase systems and is suitable for measuring AC sources such as Shore Power, Generators and Invertors. 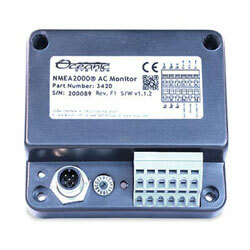 It can also measure the voltage and frequency on AC Bus Bar Systems. The unit has inputs for up to three phase voltages and up to three-phase current transformers. It is supplied with a single phase current transformer. Additional transformers will be required to measure Bi-Phase or Three Phase circuits.